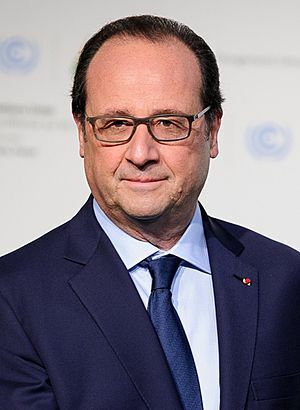 François Gérard Georges Nicolas Hollande (born 12 August 1954) was the President of France. This means he was also the Co-Prince of Andorra. He was sworn in on 15 May 2012. He was born in Rouen. He ran for the Socialist party. Before becoming president, he was a deputy for the Corrèze, and the mayor of Tulle. He studied law in Paris. He also studied at the École des hautes études commerciales de Paris and the Institut d'études politiques de Paris. He was among the best in his studies at the École nationale d'administration. He was elected President of France on 6 May 2012, defeating Nicolas Sarkozy. There were two rounds of voting. In the first, 28% of the people voted for him. In the second round, with only two candidates, 51% did. 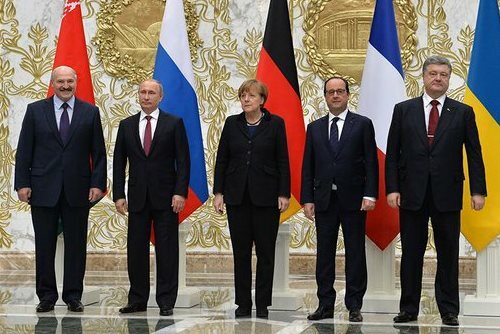 He left office on 14 May 2017 being replaced by Emmanuel Macron. François Hollande Facts for Kids. Kiddle Encyclopedia.